Love with Courage: We Need Voices Like Yours! We Need Voices Like Yours! To honor the legacy of Rev. 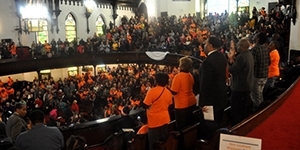 Martin Luther King, Jr., 1,500 people of faith gathered on January 18 at the First Baptist Congregational Church on the west side of Chicago. More than 20 elected legislators were there, as were the three candidates running for Cook County State’s Attorney. We called upon them for fair police reform, expanded restorative justice efforts, and working toward a fair income tax. All these people showed up even when it was 5 degrees outside, including 250 Unitarian Universalists from eight congregations. I was delighted that more than 80 people from the congregation I serve at Unity Temple showed up. Because we gathered with other people of faith and brought our voices together, we demonstrated a powerful coalition. Because we all showed up together, people in decision-making roles know what is important to us as a powerful collective. And, they will be accountable. For example, not only did all the elected officials agree to our policy platform, all three candidates for State’s Attorney agreed to meet with the Community Renewal Society every three months. I’m grateful for other religious leaders and communities who, like us, use their ability to connect and organize in order to work together for meaningful change. One of those is Rev. Marshall Hatch. Bettie Jones was killed in the incident involving the shooting of Antonio Legrier’s son. Mr. Legrier had called the police to explain that his son was suffering from mental health problems. Apparently, he had appeared dangerous to the police because he was wielding a baseball bat. However, once the facts of the case became clear, the physical evidence appears to question the story reported by the police. That week, Rev. Hatch delivered eulogies for two bereft families. Shortly after that, Rev. Hatch was on his way to a gathering I attended. He was stopped by a white man where a police car was blocking the road near the home where the shooting had occurred. “We need more voices like yours,” the man said. If you live in the Chicago area, I invite you to join me for an evening with Rev. Marshall Hatch, Pastor Ira Acree, and Pastor Cy Fields. They will share about their organization, The Leader’s Network that serves the needs of the westside of Chicago. It is a community leaders network led by these pastors. We will together explore what it means for all of us who live in Chicagoland’s western corridor to stand together, in relationship, as we work to oppose violence, corruption and injustice. We need more voices like yours. This gathering is hosted by the Community of Congregations.